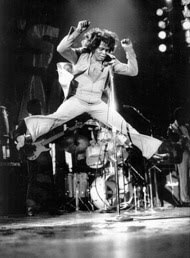 The James Brown Guide to Injecting Soul into Work ~ HELLO, my name is Blog! When I was in college, my roommate and I started a band. Our first gig was at the campus record store. Seven people showed up, our guitars were out of tune, and I’m pretty sure there was something green my teeth. We didn’t even meet any girls after the show. We never played out in public again. Because there’s no such thing as singing with too much soul. 1. Clarify your definition. I’m not the authority on soul – that would be James Brown. But I do think it’s important that each of us consider what it means to inject it into our work. Here’s my philosophy, as a writer, performer, artist and entrepreneur: To inject soul is to own your gift. To inject soul is to deploy intense humanity. To inject soul is to exhibit naked personhood. To inject soul is to stay in touch with your own story. To inject soul is to enable a near life experience. To inject soul is to widen the boundaries of your being. To inject soul is to create moments of perfect symmetry. And to inject soul is to show people what’s under your fingernails. Because no matter how you define it, when you inject soul, you are impossible not to watch. When you inject soul, you become a voice worth listening to. When you inject soul, you make people who aren’t your customers, wish they were. And when you inject soul, you earn a permanent spot in people’s heart. Might be worth defining for yourself. What do you bring to your work that nobody else in your industry can touch? 2. Scare the hell out of yourself. Soul stockpiles when you embrace anarchy and break the barrier that shields you from naked experience. Nothing dangerous, obviously. I’d hate for you to scare yourself to the point that you wind up in the hospital. Or violate your values. Or contaminate your personal constitution. But fear is the final compass for finding what matters. And you’ve got to give that fear a clear voice. Otherwise you’ll never execute anything worth talking about. My suggestion: Only pursue ideas whose risk level is through the roof. 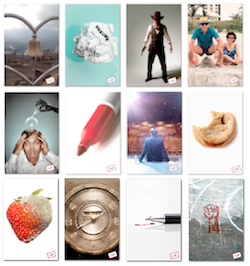 Create a personal filter that gauges the level of danger in whatever you undertake. Otherwise your audience will yawn. For example, as I writer, I’m constantly asking, “What do I risk in publishing this material?” That’s how I keep my writing bloody, relatable and remarkable. That’s how I dance on the edge of chaos on a daily basis. And that’s how I stay focused on the work that matters most. Remember: Ideas become interesting the moment they start to scare you. If it doesn’t hurt, you’re not there yet. What soul will your fear help you deliver? 3. Care about people’s experience when they’re around you. 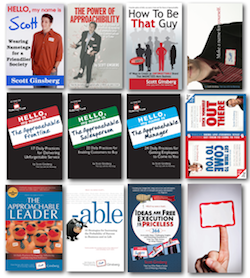 Being approachable isn’t just about how people experience you – it’s how they experience themselves in relation to you. That’s the next way to inject soul: Give people something they didn’t know they wanted. By taking them places they didn’t expect to go, you send them on mental journeys from which they never fully return. That’s the secret nobody bothers to tell you: You’re not in business to provide a service – you’re in business to center on, and become known for – a unique way of interacting with the world. Maybe it’s the fastest. Maybe it’s the friendliest. Maybe it’s the funniest. Doesn’t matter. As long as you repeatedly articulate your est, injecting soul will be a natural byproduct. Remember: Every organization interacts with people – but not all of them brand it as their inherent, unique superiority. How could you speak to your market in a way they’re never been spoken to before? 4. Expect less from technology and more from each other. You can’t filter your entire life through pixels – not if you want that life to matter. That’s why approachability is not going away. In fact, it’s becoming more essential by the day. If you want to inject soul, you have to make things unexpectedly personal. Instead of outsourcing the human function, practice interactional casualness. Compress your personality into micro moments of individual expression. But not as calculated actions – as loving impulses. Otherwise you come across as cold and alienating. And your flat and inexpressive language will go unnoticed. Believe me: Investing time and money to inject soul is always worthwhile. I challenge you to expose the place where you really live, fearlessly open the closed room and bring all of yourself to everything you do. It might be inconvenient – but it’s never impossible. And people always notice. Where are you sacrificing experiences for expenses? 5. Pass the torch. Part of making a name for yourself is helping others make a name for themselves along the way. After all: People shouldn’t have to wait for permission to express themselves. Their unique light should shine bright and consistently. Otherwise, crushed under the weight of can’t, they wind up delivering emotionless, forgettable non-service. That’s the next secret to injecting soul: Petitioning the people around you to do the same. Helping them light their own fire. And giving people permission to express their personal brand unabashedly. Not only does this color their daily experience, it also reinforces their freedom and invites them to demonstrate their creativity. Remember: Like a pocket full of fireworks waiting for a match, the people you work with would give anything for the opportunity to show you how much soul they really have. Be an enabler of that. Help people believe in their own possibility a little more. They’ll work their hearts out for you. Do you love yourself enough to get the hell out of the way so people can articulate their fabulousness? That’s what happens when you inject soul: People feel it. Down to their bones. And if you want to compete in today’s marketplace, that’s the price of admission. Long gone are the days of interrupting people until they die or hire you. Long gone are the days of tricking people into buying something. Now, you’re no longer just competing for people’s attention – you’re competing for their emotions. And unless you’re willing to loosen the tightness of your heart, you’ll never cut through the clutter. Benefits, schmenefits. Your soul is what people buy. How are you leading with that in the sales process? REMEMBER: Soul informs brand, and brand informs your bank account. James Brown would be proud. Are you known for your sale or your soul?